Official Vision Trips will occasionally be offered. Select individuals may be invited to attend, at the discretion of Planet Changer’s Board of Directors and/or President and CEO. Vision Trips are focused on giving attendees a clearer vision of the work being completed through our projects and initiatives in rural communities. Grassroots community collaboration make it possible for us to combat poverty and inspire hope, Vision Trips provide a unique opportunity to observe this first hand. Vision Trips are not designed for the needs of the team that is participating, but rather for the people and communities that will be receiving the team. 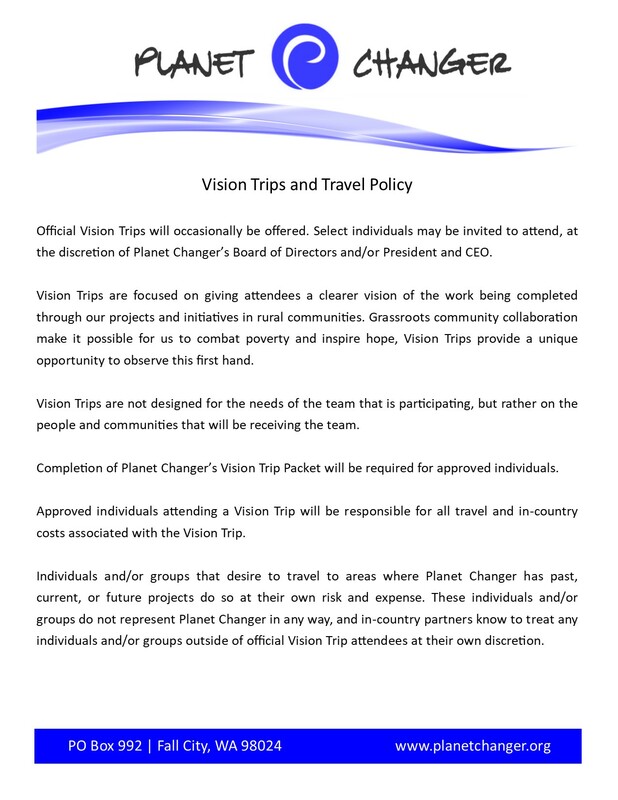 Completion of Planet Changer’s Vision Trip Packet will be required for approved individuals. Approved individuals attending a Vision Trip will be responsible for all travel and in-country costs associated with the Vision Trip. Individuals and/or groups that desire to travel to areas where Planet Changer has past, current, or future projects do so at their own risk and expense. These individuals and/or groups do not represent Planet Changer in any way. In-country partners know to treat any individuals and/or group requests that they receive outside of official Vision Trips at their own discretion, and they have no obligation to individuals/groups outside of official Vision Trips. This policy is in place for the protection of our in-country partners and the communities we work with. A printable copy of our policy is available here. We encourage any person considering a trip to volunteer in a developing nation to read this article and this article. Please make a responsible, informed choice in whatever organization you visit.